As I write this, there are 61 hours left on the Torment: Tides of Numenera Kickstarter and they have raised $3,424,278...oh wait...$3,424,752...no it's now...$3,424,787. Well who knows how much it will be by the time I post this blog entry, but it'll be a lot. Also as I write this there are 41 hours left to go on the Hollow World Kickstarter and I have raised $24,643. While I'm a backer of the first, I obviously am more interested in the later, and while it has only earned a tiny fraction of what Torment has, I'm very pleased with the result. In fact, to say that the project exceeded my expectations would be a huge understatement, and I want to thank everyone who has contributed to its success. Each one of which is being done by a traditionally published author. I'm so glad to see others taking advantage of this technology to connect directly with readers. We are just $357 away from the stretch goal which will provide backers with signed Riyria bookmarks, and one of my short stories. 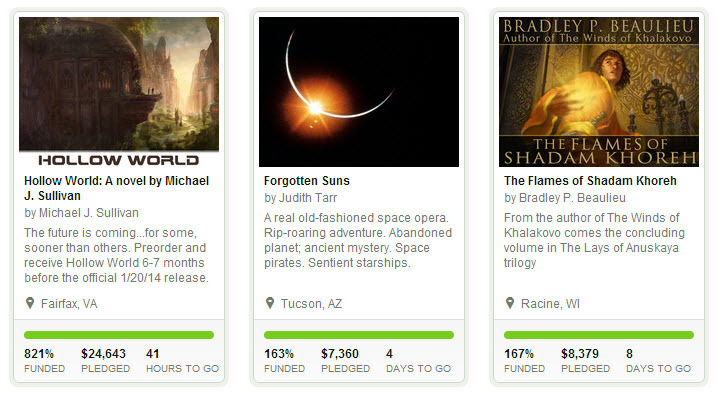 If we earn $2,389 in the next two days then Hollow World will take the #1 spot for most funded novels. It seems like a lot to do in 41 hours but considering $2,808 has come in the past three days it's not inconceivable. So if you want to get in on Hollow World - act fast. Only those that pre-order will be able to get the book in June/July everyone else will have to wait until the official release on January 20,2014. And for those who have already contributed....again my thanks for making this so successful...now I have to go back to proofing The Rose and the Thorn. Unique post! Articles that have meaningful and understanding comments are more enjoyable, at least to me. It’s interesting to read what other people thought and how it relates to them or their customers, as their perspective could possibly help you in the future. Very important information, it is not at all blogs that we get this; congratulations I was looking for incredible like that and found it here. Well written, and some good points. The most important part of an object is the identify to action. But surely, the title is first of a series of important steps to guide the reader there. It looks that I’ve just used the main points of this article! I really like that idea of withholding a forceful piece of information. When used in the right way, it is a good way to grip a reader’s notice. Writing a blog post is really the main point for the develops of your websites. Thanks for sharing amazing tips. Hey there, you have done a fantastic job. I will absolutely dig it and I suggest to my friends. I am sure they will be benefited from this article site. Incredible post! Articles that have important and sense remarks are more delightful, at any rate to me. It’s fascinating to check what other persons thought and how they identify with them or their customers, as their point of view could help you later on. Generally, I never comment on blogs but your article is so convincing that I never stop myself to say something about it. I am really very glad to say that this post is very interesting to read. You are doing a great job, Keep it up. We think each team has its’ story. From grown, grind, to develop. The power of tea creates the inside peace and health for humanity. We decided to share the benefits and support the association of cheap essay through the online platform to reach the millions out there who already know and or have heard about the benefits.